With all the wisdom and expertise earned from a long and successful playing career, it’s perhaps only logical that Goran Ivanisevic should cross over and become a winning trainer. Fellow Croatian Marin Cilic is the one to benefit from Ivanisevic’s skill and advice and it’s fair to say that this involvement had transformed the younger man’s career. It’s fair to say that Cilic enjoyed some success under his former coach Bob Brett who was with him between 2004 and 2013. In fact, it was Goran Ivanisevic who introduced the two men. Back in 2004, Ivanisevic was still active as a player but had befriended Cilic and got Brett involved to help kick start his professional career. 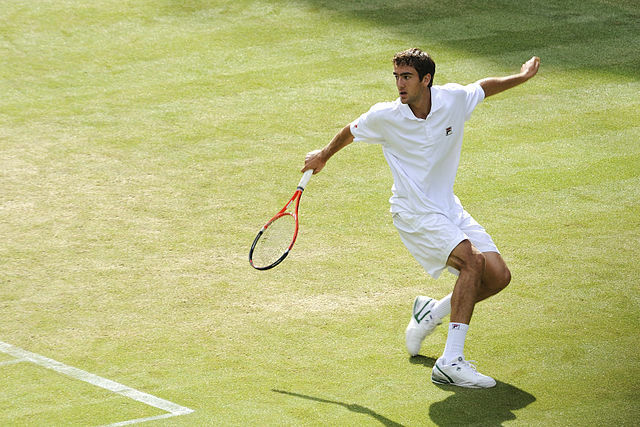 Cilic’s first ATP tour win came in 2008 and by 2012 he had taken eight tour titles in total. Progression in the Grand Slams was fairly modest however with a semi final appearance in the Australian Open in 2010 being the only real highlight. Admittedly, this was and still is an era dominated by players such as Novak Djokovic, Andy Murray, Rafael Nadal and Roger Federer but how could Cilic take his game to that next level? 2013 was the year that Marin Cilic’s career was to change dramatically but it didn’t start too well for the 25 year old Croatian. An unexpected defeat in the third round of the Australian Open precipitated a calamitous year that saw him pull out of Wimbledon with a knee injury before an initial suspension followed a failed drugs test. That suspension was overturned as Cilic had merely recorded a minor violation after an injudicious use of Glucose Tablets. He hadn’t intended to enhance his performance and was cleared but this was obviously a turbulent year for the Croatian. Ultimately, it was one that ended when he sought the help of an old friend. During those tough times, Cilic had dropped to number 47 in the world rankings but 2014 saw an immediate improvement. Although the Australian Open yielded a second round defeat he had reached the quarter final of an ATP tour event in Sydney. In 2013, the player had reached a low ebb by the time that Wimbledon came around but the tournament 12 months later marked a real turning point in his career. Under the expert guidance of Goran Ivanisevic, he reached the quarter finals at SW17 for the very first time but the best was yet to come. Whatever Ivanisevic was doing it was certainly working as his pupil produced one of the biggest shocks in modern day tennis. At the 2014 US Open, Seeded a modest 14, the highlights of his progression included a straight sets win over Berdych in the quarter finals and then, once again, three sets were all that was needed as Cilic breezed past the great Roger Federer. Having overcome such brilliant opposition, the Croatian was confident of victory against the number ten seed Kei Nishikori and he didn’t disappoint, winning in straight sets yet again for an emphatic, if unexpected Grand Slam victory. Whenever you read reports about the relationship between Goran Ivanisevic and Marin Cilic, the word that keeps cropping up is ‘inspirational’ and if you think about Goran’s character, that’s no great surprise. Cilic then spoke about the first time they met. After parting with Bob Brett, Cilic described the link up with Ivanisevic as coach as an ‘obvious decision’. Since then he credits Goran for improving him in key playing areas and in particular his serve. But it’s not just the technical aspects that have been enhanced. Cilic says he has greater mental strength now and is enjoying himself much more on the court. Marin Cilic has yet to repeat his one Grand Slam success but at 27, he still has time on his side to secure another major. To do so, his fans will hope that the great Goran Ivanisevic stays alongside because clearly he is an amazing coach and a vital component.